The Fifth Assessment Report of the Intergovernmental Panel on Climate Change will be out from September this year. This should be a big deal: it’s six years since the last report, and that was headline news at the time. The report will be a chance for climate change, and what we do about it, to be one of the top issues in public debate for the first time since the 2009 Copenhagen Conference. But for climate campaigners, activists and anyone who wants better action on climate change, what should be done with this opportunity? I believe it would be a mistake to use the coverage of the report to try to score points in the same arguments that have dominated over the last few years. Instead, there are other approaches that could reach a wider audience, move the debate past recurring arguments, and perhaps create a basis for more useful action on climate change. The problem, as I see it, is that much of the debate about climate change is dominated by whether or not it’s happening, how quickly it will happen, and the meta-debate about why ‘so many people’ don’t agree with the vast majority of climate scientists. One reason this is a problem was explained by US Republican pollster Frank Luntz: he recognised the goal for opponents of government action on climate change should be “to make the lack of scientific certainty a primary issue in the debate”. So long as the debate is about the science of climate change – most people only hear that there is a debate, not what each side is saying – people aren’t talking about what to do about it. But you might respond: how can we ask people to agree to action on climate change when they don’t believe it’s happening or caused by humans? It’s a logical question. But the polling shows that it’s a mistake to assume there’s a logical chain of reasoning. In fact, the debate about belief in climate change is based on two misconceptions: that people are widely and increasingly sceptical about climate change, and that their desire for action to tackle climate change depends on the extent to which they think it’s happening. Because of these misconceptions, I think that the debate about whether or not climate change is happening is a distraction for people who care about climate change, and that we should change the subject. The evidence is pretty clear that agreement with climate science is high and stable and that doubts about it are not increasing. The following chart is typical in showing that the same proportion now believes that climate change is real and manmade as did so before the UEA email hack. Most people think it’s real and manmade and a third think it’s real but natural; barely one person in 20 thinks it’s a fraud. There are a couple of exceptions to this. Globescan found that environmental concerns fell this year, though that runs counter to every other poll I’ve seen. Agreement with climate science also fell before the start of the chart above, after a peak sometime around 2006 and the Stern Report. But more important than what’s happening to those numbers is what the numbers mean. The polls suggest that what people say about their belief in climate change doesn’t have much to do with whether they want action to tackle it. 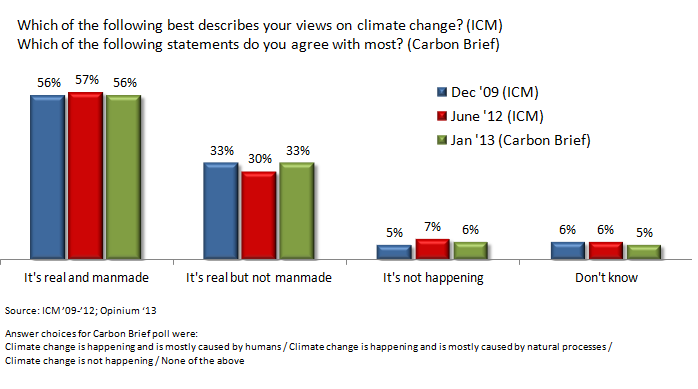 Just in case that was a freak or a mistake, we tested it again in the recent Carbon Brief poll. The conclusion was similar: of those who say climate change is natural and not caused by humans, nearly half want government action to tackle it. So the evidence is clear. Outright climate denial is low and not increasing. Most people think climate change is real and manmade. 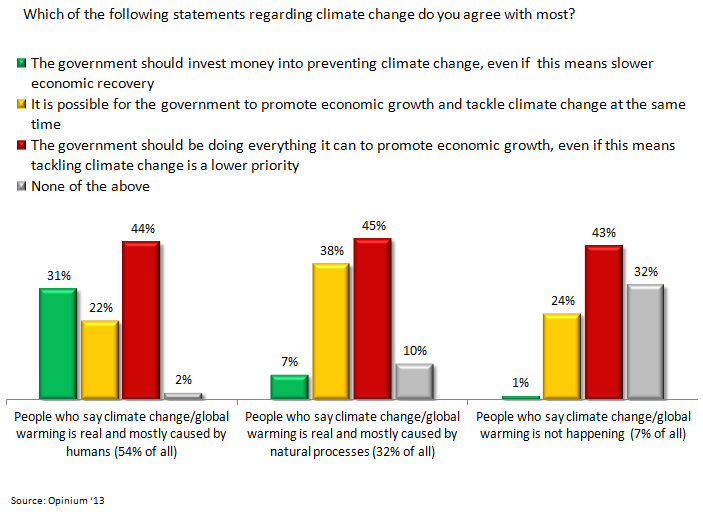 And of those who think it’s natural or not happening, many still want government action to tackle it: a logical disconnect that suggests the debate about belief in climate change has been taken more seriously than it deserves. As Chris Rose has pointed out, responses to questions about belief in climate change are often about something else – a declaration of which ‘side’ the respondent is on. It’s not a debate that climate campaigners can win in its own terms. The question is, if not scientists’ confidence about anthropogenic climate change, what should campaigners and communicators talk about? There are two key arguments that I believe are crucial for improving the case for better action on climate change – but which I don’t see being made at the moment. The first is that climate change is very likely to hurt people in the UK: people alive now and their children. Not just through indirect effects like more expensive food and foreign political instability, but also directly, through flooding and killer heatwaves. There are people who’ll suffer more from climate change than Brits: people living on flood plains in Bangladesh, in low-lying islands, and in the Sahel, for example. And many wonderful species will become extinct when their habitat changes. Almost everyone is sad to hear about that and agrees that someone should do something. A few internationalists and conservationists might even do something themselves. But nothing mobilises people like something that directly affects them and their family. The pointy end of climate change – that the UK is very likely to face more floods and more killer heatwaves – is still largely absent from the debate. It shouldn’t be. The 2003 heatwave killed 2,000 people in the UK; it is likely that summers like that will be the norm by the end of this century. But only 34% in the Carbon Brief poll recognised that climate change is likely to cause more UK summer heatwaves. If the UK debate about climate change is to become a better basis for action, it needs to be made personal. Instead of talking about far-off people and animals, there should be much more talk about what climate change means for people in the UK. This should include a ban among climate campaigners on references to global degrees of warming in conversations with anyone except climate change experts. The thought of the UK becoming 3° warmer sounds quite nice to me. You have to be familiar with the subject to understand what 3° means in practice: much wider variations in temperature and rainfall, with flooding and some summer days that are unbearably hot (yes, in the UK). The other argument that’s still missing is the one tackling the view that we shouldn’t make sacrifices for climate change because it would disadvantage us against other countries that aren’t doing the same, particularly China. It usually follows the structure: “why should we do X when China will just build Y power stations in the next week/month/year?”. In the past, the best response to this argument was that we couldn’t persuade other countries to make sacrifices unless we showed that we were doing so ourselves – and since developed countries had been causing global warming for so much longer it made sense that we acted first. But now the argument is much easier to rebut. It’s not true that rapidly growing countries like China are leaving the hard work on climate change to developed countries. China may be the world’s biggest emitter (though per person its emissions are still lower than the EU’s when including international transport and/or emissions from production of exported goods), but even as it industrialises it’s now using trading schemes to make it more expensive for its businesses to emit greenhouse gases. So it shouldn’t be hard to knock back the argument that taking action on climate change puts us at a global disadvantage – and that’s before we start talking about the potential economic benefits of investing in low-carbon industries. The debate about climate change has stagnated over the last three and a half years, stuck on belief in climate science. 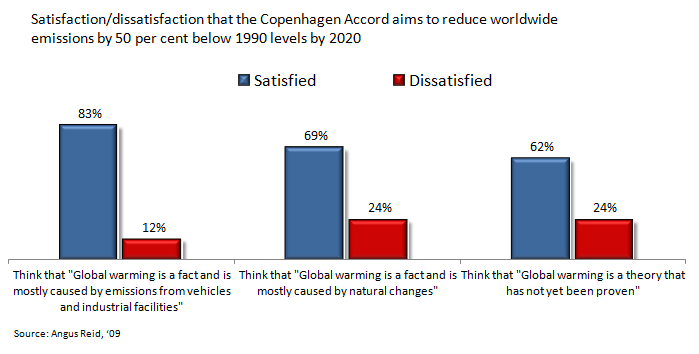 But that debate is based both on a dubious claim that scepticism is increasing and on the understandable but misplaced assumption that there’s a logical connection between belief in climate change and desire for action to tackle it. The IPCC’s Fifth Assessment Report will be an opportunity for people who want action on climate change to get it back into the news and to start talking about something that feels meaningful for most people*. Partly this means neutralising the out-of-date criticism that it’s pointless for the UK to make sacrifices to reduce climate change when other countries aren’t doing the same. But more important is to make the case that tackling climate change is a matter of self-interest for British people. This means recognising that most people are, naturally, more interested in what happens to themselves and their family than what happens to far-off people. The projected impacts of climate change for the UK – floods and killer heatwaves – are themselves serious enough to justify action: it’s time to start talking about them. * The timing of the report’s publication is unhelpful for this because the first part to be published will be the report on the physical science basis rather than those covering regional impacts or efforts to stop climate change. But that doesn’t stop climate campaigners using the opportunity to move the debate onto more useful territory. This entry was posted on Sunday, June 9th, 2013 at 16:03	and is filed under Climate Sock. You can follow any responses to this entry through the RSS 2.0 feed. Both comments and pings are currently closed. Per person chinese emissons are now en par with the EU per capits emission. And I read that in the Guardian. They are also projected to continue to rise. Interesting point, thanks. Was this the article: http://www.guardian.co.uk/environment/2012/jul/18/china-average-europe-carbon-footprint ? If so, it’s just for electricity, so excluding transport and emissions used in the production of exported items – which would mean the EU’s is still higher (though not by all that much). I’ll change the post accordingly. Actually, it wasn’t just electricity generation, energy use seems to have been interpreted as just electricity. It was per capita as a whole, cement being one of the biggest. The other issue, which is electricty related, is that China and India’s and a large percentage of the world increasing usage of coal, over 1200 coal plants (extra) planned. Much is made in the media that China,for example has closed down 80GW of coal in the last decade, but what gets failed to mention, is that about 50GW per year has been built in that period (newer, cleaner and more efficient no doubt), but a large increase in coal CO2 emissions. These coal fired plants will have a life of a minimum of 30 years, the Guardian graphic shows an extra 519GW of extra planned Chinese coal fired stations, (India more) reporting on this report suggested that China is on an emissions trajectory to surpass the USA’s emission within a decade. Thanks, my mistake on the energy/electricity point. I should also have said “international transport” (rather than just transport). I very much agree that there’s still a lot of new emissions sources being planned and built in China – and that their total emissions are still far from dropping (it’s still just the carbon intensity that may be falling atm). My point was to show that it’s now clear that China’s doing something about it – even if there’s still a lot to do, at least it can’t be said that we’d be putting restrictions on ourselves when other countries aren’t. On your point about the West/EU becoming increasingly irrelevant, it’s hard to disagree that we’re a fairly small and shrinking proportion of global emissions. But from the perspective of this small island we can’t do much about mitigating climate change unless we’ve reduced our own emissions – either because maybe that’s all we can do, or because it gives us legitimacy to persuade other countries to do more. There are some serious flaws in your theories. 1) No matter how they fill out a survey, people like energy more than they’re scared of AGW. We know this because the UK CO2 footprints haven’t declined one bit when imports are included. They might be using more efficient machines but they’ve imported more of them from China. 2) Apart from nuclear (that is set to decline) there are no viable low carbon energy sources that provide reliable, copious, affordable energy. Without a replacement for fossil fuels the only option is to use less energy and to effect that, the evidence for catastrophic warming must be cast iron – it’s not even close. 2) No scare story (one without tangible proof) can outdo the works of Hollywood and despite the best that they can throw at the public, the public have shrugged and got on with their lives. Great to be scared for 90 minutes but then you get on with life. 3) You cannot use the science to make AGW scary for Brits. There is no proven link between severe weather and global warming (IPCC SREX) and predictions for the UK have so far proven to be false. Eg I’ll see your 2003 heatwave and the 2000 extra deaths and I’ll raise you the 2012/2013 winter that saw an extra 1000 deaths a week between week 50 and week… well now. 2013 CET (central England Temperature) so far is a whole degree C down on ‘normal’ and will see the long term average return to near the zero anomaly if the trend continues. March, the poster child for UK warming, was 3ºC colder than average. Gee, what warming? As for flooding, the MET office predicted warmer drier summers and wetter warmer winters, unfortunately that’s the opposite of what we’ve experienced in recent years. What flooding we have seen is not exceptional in the UK flooding history, especially when land changes, drainage management and increased housing are factored in. Attempts to link current cold winters with AGW get the derision they deserve. 4) The public aren’t dumb. If you want to change the way the public use energy you are going to have to talk to them as grown ups. That means telling them the truth, the whole truth and nothing but the truth. You have to listen to their concerns (you can’t get those from surveys) and respond to them in a sensible fashion. Talk to sceptics first, we’re not idiots or monsters, just more aware of the problems. And ultimately if the public still don’t do what you think they ought to… well that’s their decision. You can’t force people, con people or guilt people into cutting CO2. They have to agree that the risk is worth the cost. And remember the costs are staggering. Thanks very much for commenting. I hope you don’t think I see you as an idiot or a monster! I most agree people generally don’t see there being a strong enough case to justify reduction in their consumption at the moment. That’s one of the main reasons I think the case needs to be made much better than it has been so far. That doesn’t mean scaremongering – as you say the public most certainly aren’t dumb and if they’re being spun a line or told a Hollywood story they’ll sense it. For me that means explaining what’s projected to happen in the UK (including the uncertainties). I can see we disagree about the interpretation of the evidence about this. We both think we’re right and I very much doubt we’re going to change one another’s mind! One thing I’d say that I think lies at the heart of the difference is we’re talking about different timescales: what’s happening over the last few (and next few years) in comparison with what’s projected to happen over the next few decades. And in terms of electricity sources, I’d incline towards agreeing that nuclear would be essential for a low-carbon network. But I don’t pretend to be an expert on that so I’ll leave that there. Thankyou for being friendly and prepared to listen 🙂 Sceptics don’t usually get treated with respect. We probably don’t think too far differently on the science. I personally can’t say if AGW will be large or small but I’m certain the scientists have jumped the gun. Cried wolf. That doesn’t mean there isn’t a wolf but it’s certainly turned the public off when the scientists have been so sure about their predictions that have, at least in the short term, failed. They’ve especially alienated the practical sciences/engineering fields who have been raising problems from the start and but have been treated with contempt. Scientists have courted politicians and celebrities and ignored the rest of us. Big mistake. Climate science needs to realise it’s no longer a comfy university research subject that measures success by how many papers it publishes or how many glowing reviews it gets from its fellows. If it’s a globally crucial issue, it should act like it was. If climate science was a chemical company would it still be trading? There are no standards for documentation. It’s accountable to no one. There’s no quality control or auditing. Failures are met with shrugs and a plea for more funding. It ruthlessly tries to silence its detractors and avoids public debate. It supports some seriously shoddy products, despite the bad reflection on other more legitimate work. It… well the number of duff things done or not done in the name of CAGW are staggering. If climate science was a company it would be being investigated. But none of that matters because if the science is flawed the solutions are crazy. While climate science is guilty of exaggeration the low carbon energy machine tells whoppers. The description of wind power as ‘free’ was particularly egregious. In addition the hint that windmills could reap power endlessly from the air without using raw materials was an out and out lie. The carbon fibre blades aren’t even recyclable and each year of operation sees the electricity output of a turbine decline to the point they need replacing. Worryingly it looks like the lifespan is 15-20 years instead of the 20-30 years predicted. Free my backside. Each time a member of the public hears and recognises an untruth about AGW or the solutions they become a little more sceptical. They wonder ‘if the bit I do understand is faulty, what about the rest?’ Once people have started to doubt it’s hard to pull them back with the kind of sketchy information that is currently presented from the AGW machine. The time for glossy awareness campaigns has passed. One thing most AGW proponents don’t realise is that most sceptics were early adopters. We’re mostly pro science people so we took an interest in AGW from the point it became a global issue. The science has never been as solid as it was being presented and it was disconcerting to discover holes. It was positively alarming to be attacked for pointing out the holes. Additionally, a lot of us investigated the ways of reducing CO2 and thought ‘this is much harder than it’s presented, in fact it’s almost impossible’. My own expertise comes from having a small carbon footprint and I know that very few people could or would live the way I do. I often wonder how many of those advocating cutting CO2 have seriously attempted to reach the 2 tonne target that we are aiming for. How many of them have even calculated their CO2 footprint at all? If you want to be serious about CO2, why not ask every supporter to offer their CO2 contribution each time they introduce themselves? ‘Hi, my name is TinyCO2 and my footprint is 3-4 tonnes, what’s yours Mr Gore?’ ‘Well err it’s cough, mumble, flying’s part of the job you know and air travel only makes up 1% of global emissions, it’s important I get the message out’. We all have excuses why our emissions are essential and it seems it’s always somebody else who’s wasting energy. Seriously cutting CO2 would involve seismic changes in society. It’s effectively the Industrial Revolution in reverse and with a goal of a lower standard of living at the end of it. What level of persuasion would that involve? Really interesting to hear your starting point and perspective with this, ie as an early adopter who became disillusioned – but still has a low CO2 footprint (hence the name, I guess). And I completely agree about how hard it is to meet a 2 tonne target, particularly for people who’ve got disposable income to travel, buy gadgets etc. Some people believe that mass individual action can be enough to change lifestyles and bring people under the target (the seismic change you mention). Personally I’m very doubtful – if the target’s to be met it’s from the supply side. Which brings us onto the other parts of your comment. I think one of the challenges for people who want climate change to be higher profile and taken more seriously is the multitude of different voices that speak on its behalf. To name just a few there are climate scientists, there are campaigning NGOs and there are businesses that stand to make a profit from investment in ‘green’ technologies. They all have different motivations and boundaries of the kind of language and levels of accuracy they stick to. But most of the time they’re treated as if they represent the same cause – and I think that’s a cause of problems. I can believe that ‘green’ technologies have been oversold – eg, as you point out, on the basis of the lack of emissions from their operation, downplaying their manufacture. There are financial interests to emphasise this – you’d expect them to push their language as far as they think is acceptable. Everyone who cares about finding solutions to climate change should be just as worried about that as you are. And if that contaminates perceptions of climate science, that’s a problem. Because of course the conclusions of, eg wind turbine manufacturers, and the findings of peer-reviewed scientific publications, are completely different things. There’s no reason an error or even deliberate omission/falsehood in one should have anything to do with the other. That’s probably as far as we might be able to get before we have to part company (if indeed you’ve agreed with me to now)! As I said before, I disagree with you about the accuracy of the science up to now (not necessarily how it’s been represented by others). I think it’s been largely excellent; out of the huge amount of papers in top-ranking journals and especially the IPCC reports, there’ve been a very small proportion of things that have now been shown to be mistaken. Most predictions have been slightly modified by later results, rather than overthrown. I also disagree with your comment that detractors are ruthlessly silenced (I don’t think most academics could ruthlessly silence a windchime) and public debate is avoided (apart from by the shier researchers). But I accept you probably disagree with this – and I doubt we’ll change one another’s minds by comments below of a blogpost. Why is it pointless, and out of date. it is true and increasingly so.. the issue needs to be dealt with..
if the UK was advocating massive research spending into fusion, thorium or even fast breeder nuclear reactors, we as the rich West can afford to do this.. people would jump on board, no regrets, bar cost ( even Mark Lynas and George Monbiot) but imported token windturbines solar panels and carbon taxes and trading, are just pointless, if you think the world is going to warm 01C, 1.0 or 6.0C or anywhere in between. Witness Prof Myles Allen agreeing with David Rose at billions wasted on pointless policies in the EU! We could even be sad to have tried the leadership role but to no avail. We haven’t even made a success in Europe where the enthusiasm has been greatest. Time for plan B.
you are buying for young children.